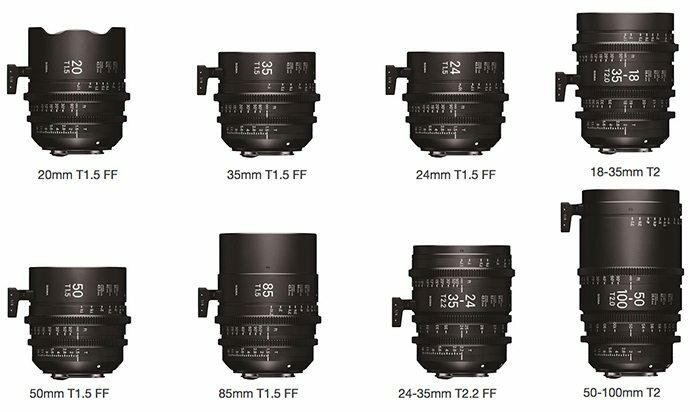 Sigma has announced six new Full Frame Cine E-mount lenses along with two T/2.0 Super35 zoom lenses. 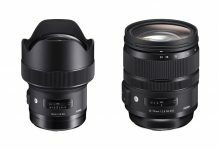 The newly released lenses include Sigma 18-35mm T2.0 (Super 35), Sigma 50-100mm T2.0 (Super 35), Sigma 24-35mm T2.2 (Full Frame), Sigma 20mm T1.5 (Full Frame), Sigma 24mm T1.5 (Full Frame), Sigma 35mm T1.5 (Full Frame), Sigma 50mm T1.5 (Full Frame), and Sigma 85mm T1.5 (Full Frame). SIGMA CORPORATION is entering into the cinema lens market with the release of its SIGMA CINE LENSES, which are specifically designed for cinematography. This a smart move by the company as there is an increasing demand for higher resolution in the world of digital film production. The company claims that the new lineup of lenses is compatible with the latest, high-resolution digital cinema cameras. It has also developed its own production system for mass production of high-performance lenses for ultra-mega-pixel shooting. The company claims that the new lenses offer the highest optical performance in its class. High-Speed Zoom Line : offers the constant aperture of T2 throughout the zoom range. The optical performance is ready for high-resolution shooting such as 6K – 8K. Furthermore. FF Zoom Line : compatible with a full-frame image circle. The optical performance is ready for high-resolution shooting such as 6K – 8K. This lens is not available in PL mount. FF High-Speed Prime Line : ranges from 20mm to 85mm. All five lenses are T1.5. They are compatible with full-frame sensors, and offer superior resolution than other high-end prime sets do. The five prime lenses do not require a change in the lighting to shoot a variety of cuts, which offer greater consistency to the film’s look and color/contrast before it enters post-production. All SIGMA CINE lenses are weatherproof and feature luminous paint marking. Other features include a long focus rotation of 180 degrees, a manual linear iris control, and electronic mounts. The SIGMA CINE lens design sports an 82mm front for ND filters and a 95mm front diameter for matte box use and standard gear positions for accessories. Full details about each single lens can be found here. The new Sigma E-mount Cine lenses are manufactured in Aizu, Japan and will be available toward the end of 2016 [in Japan and USA in the first phase]. The prices have not been revealed as yet. 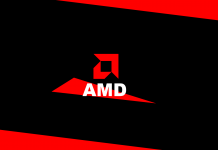 The company plans to develop additional zoom and prime lenses along with support for PL mount camera systems.